Okay, so this is the script so far. 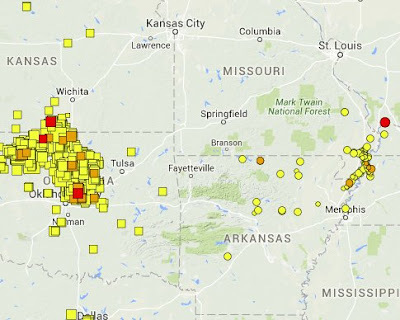 Death, in the form of a giant New Madrid earthquake is bored with Oklahoma. He thinks the tornadoes are having all the fun, so he leaves for a holiday. For real, my current hypothesis is that injection of fresh water is causing chemical stress corrosion which is forming a new-New Madrid. That is why I am always tracking the health of the gas or oil freshwater fracking industry. The can inject all the deep 'produced water' all they want, since it is non-aggressive to quartz. New Madrid was a natural seep that probably took thousands of years to set up. OK is doing it a thousand times faster. The last big action was in December, and a bit of leftover action in January due to the warm El Nino. But then a good freeze came, and freshwater fracking was shut down. It started again at the beginning of May and we had a good run of 3 M3's a day, with a 4 on the weekends. It seems to be off again, and I can't figure out why. We know that they would lie like burgers*, about what they are injecting, but I can't see a reduction in this type of waste. The only way I get to save my non-existent reputation is if we have a big one soon. If it it totally peters out, I'll have to re-think my faith in basic physics. Perhaps join the philosophy club. Bah! *I make up these things. We made our own long weekend. Wow, a May heatwave! Some nights we were sweating like pigs, which finally forced us into the water. By the end of the weekend, the water was a normal July temperature. Tons of dragonflies have wiped out the blackflies, and our end of the lake is very dry, so the mosquitoes are still light. But when we went to the marina this morning, our car was in the shade, and there was a cloud of moskies so thick, that we were swatting them for half an hour after we drove off. Haven't seen anything like that, since I was canoe portaging through swamps. Not much really happening, but nothing much happening anywhere else. "It never rains in hot Trawnna, but let me lay it on ya, ....."
I'm showing this because it looks like they are going to do all the scaling, while putting up cloth to 'protect' the shale. Good thing we are going into our Spring dry period before the thunderstorms. You can see the large shale talus at the edge. I had thought this slope was failing because the existing armourstone was being undermined by the river. But that stone was on a solid caprock, and didn't move. The slope is failing due to shale weathering. This shale has a wonderful property, once exposed to air and moisture, it pops like popcorn. It has joints that help it along. I saw one on the exposure. A fresh exposure like this is always a geologist's dream. Anyway, the retreating shale allows the till above to slump. The recent big slumping was triggered by the guy with the swimming pool just dumping water over the edge, but it would have happened soon. These guys are releasing the till above by their excavation, but the dry weather should help. Once the armourstone is on with the useless cloth, the weathering can start all over again. The usual cure would be to pin on some steel mesh and use shotcrete to hold the shale. Probably 1-2 metre-long bolts to get by the joint expansion. I don't know how you would support the till which looks like it is ready to go any minute. Perhaps more pinning. Or scaling with the same support as the shale. You would need one heck of a long excavator. Addition. I'm just adding this because they are using classic 'castle' construction, which is a rock face filled with rubble. This is fantastic! Tues. update - still building Hadrian's Wall. It's beautiful. Super hot and dry today, dessication cracks all over the place. Of course, that doesn't mean anything. Certain others in the house love that social cesspit FB. On this, a letter was forwarded, dripping with sincerity, about how a teacher wanted to demonstrate social media to her students. In it was another heart-felt endorsement from the famous singer Selene about a face cream she wanted all her friends to have for free. This miracle cream, true belly, could be had for free if you gave your email and credit card number. I was asked about it and I immediately googled 'true belly scam'. The whole page was filled with scam titles, yet inside there were more wonderful endorsements. That dang company had saturated googs with phoney shell companies. You had to go to the second page for reality. So they send you a little jar of sour cream, and then whack your credit card for hundreds of bucks. They use tear-off shell companies to fool the credit card companies. You probably have to cancel your card. Now, I'm only doing these for my retired colleagues, so they can have a laugh. I was the last paid geotech engineer in Ontario, and I had to quickly go to earthquakes when all infrastructure builds ended. As well, with cloth and tensar it became child's play to put up a retaining wall, which was the hard-core geotech's bread and butter. There are no tricky foundations in Ontario, and very few new bridges. As we know, from the Tunnel to Nowhere, they had to get a mining engineer for the paperwork, and paid no attention to him (at least it appeared that way). These people are putting cloth against shale, and are probably going to stack the armourstone against it, in a near-vertical wall. This is the ultimate 'handyman special' and it is wonderful. I don't have a single thing to say about it, but the 'club' knows. Can't wait for tomorrow! Since the season began at the beginning of May, OK has been maintaining 3 m3's a day, using a single digit precision which I think is good enough. Every weekend it has had an m4, which gives a ratio of about 20 to one, of 3's to 4's. OK is astounding in how slow it builds up, and the ratio between magnitudes of 20. In many other places, the ratio is 10. They also rate the 'intensity' for each earthquake by reports people send in. We generally have a doubling of PGV for each intensity unit. These units go up and down by 2 or 3 depending on the depth of the earthquake and its type, related to magnitude. The end of the season is usually December. That's when the gas frack water starts to freeze. If the earthquakes were caused by 'produced water' which is deep salt water, there would be no season. As with last year, we should expect a 5, or maybe a 6 by December. Like previous years, if the 6 is deep and 'normal' nobody will feel it much. But if the 6 comes in as a shallow thrust near the City, then watch out! 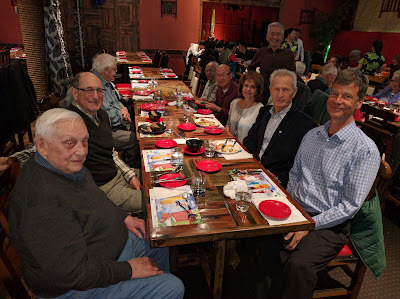 Lunch with all retired guys from my old department. Those were the best times. And lunch was very nice and reasonable at the Dragon Pearl. It is now obvious that my favourite geotech job is a ghost-town, probably cited for a zillion osha violations. On to the secondary title. Since Brunel, it has been found that engineers design for 1 in 10,000 per year chance of death. That gives a good chance that a design (like a bridge or tunnel) won't fail during the engineer's lifetime. It's engrained in the fibre of their beings. On the other hand, 'People of Undefined Intelligence' or 'workers' are perfectly happy with 1 in 100 per year chance of death. Workerism is fine with low populations who don't read, but once a society gets complex, it becomes unacceptable. In Canada, at these odds, we'd have lots of worker deaths per day. Everybody would have anxiety issues and lock themselves up in a dark room. The economy would die. Commercial airlines are 1 in 10 million, because people are very sensitive about that, and could choose not to fly. We can't have that, so safety regulations try to bring it up (down) to engineering levels. For a window washer, there is a 1 in 100 chance of failure of his main system. Add a safety system, and there is a 1 in 100 chance of that failing when called upon. Two such independent systems, put together, gives you 1 in 10,000. Since no workers would do it themselves, this requires legislation, and a heavy hand in enforcement. Most things are up there now, except scaffolding - yuck. I remember the Niagara Tunnel was like this, but they squeaked through. Our nuclear plants have been thoroughly infected with 'workerism', and so has our emergency response system. The odds of death by earthquake are at 1 in 500. I only consider factors of 10 to be significant here. So, all you thrill-seekers who dodge in and out of traffic on the 401, take over engineering design. We'll see what happens. pps. I gave this story to the CBC. Not apparently interested, even though it will cost millions. UPDATE: Today (Monday) they are back to work like nothing happened. They are draining the undrainable pit with a bigger pump and back to the original plan. The series continues! We still have lots of state-supported cartels and such in Canada. These cannot withstand the onslaught of brains, brought on by the sharing economy. It's an exciting time. Dear Akio Toyoda, I appreciate your new big push to appeal to the young. My kids are into the whole California start-up thing, and will be the only young people to afford cars. 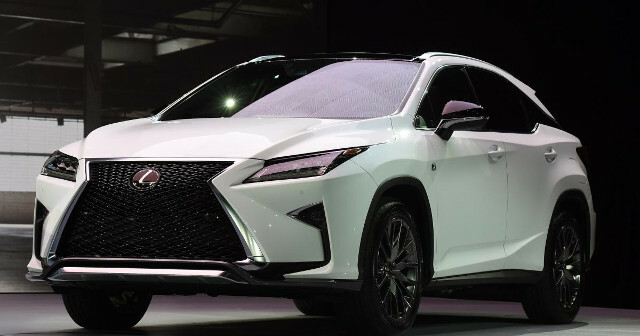 Already they are test driving the new Lexus to get Harry Rosen stuff. I love this design because it reminds me of my favourite cartoon character when I was a kid. Anyway, if you want to appeal to these start-up people, you have to revamp your internal systems to be quicker and more responsive. When I tried it, I was basically told to drop dead. Improvements would be good. I think vw succeeded with the young because they let the young people run riot in the company, and shut the doors to the kindergarten. It was inevitable that they had the classic 'rogue trader' problem. You should not do that, but treat the young, as traders who have to file risk reports. Right now, I suspect they are smothered. ps. Poor manager, he was told by his people that the battery cost one half of what it really was, when he made his magnanimous offer. No fancy lunches for a week! I don't think they know anything about an AGM battery. I put this on the main blog, instead of just my geotechnical collection because it is so hilarious. Remember calculus on how long it takes to empty a bucket with a hole in it? This is much worse as they try to empty a permeable pit below the river level. You can hear one guy saying that they should get another gravel silt bag to block things up. They must want to pour a concrete foundation, but you can do that underwater with a pipe. Or use epoxy concrete. You can only empty a pit under the river level if you use a coffer dam, which is horrible to install. Addendum, the day after. The job may be shut down, or they are taking a holiday. Usually they just rearrange the dirt. In my day, the Ministry of Labour had some hard-core geotech people. That's why you see all those heavy walls for trench work. But then then they relocated to some place horrible and lost the talent. The ghosts of these guys shudder at the concept of working in a permeable pit with the slope unravelling above. The question of seismic safety for nuclear plants has arisen in New Brunswick. There, they seem to have people dedicated to killing themselves over the issue. In Ontario, it's a different story. Nobody cares and nobody is willing to kill themselves, especially me. If some eager starving young reporter tries to raise the issue, they are met with the stony silence of the PR departments, who issue a statement that everything is fine. The truth is that seismic analysis hasn't changed for 40 years, and they 'lie' about the geology, where I define that term as 'wilful ignorance' or Clintonian Semantics. Something like the VW scandal where they want to witch-hunt young engineers, as if they had any incentive to do it. The geology is 10 times worse than anything they've bothered with. On the other hand, if use PGV rather than PGA, you find that the heavy equipment is regularly exposed to levels beyond anything an earthquake can produce. That leaves light components and they are in bad shape. I once wrote a scenario for an M7ish earthquake in Lake Ontario, where they regularly occur on a 1000 year cycle. It isn't pretty. Pickering will probably release with a near 6, which might be about the same odds. I was raised to get those odds down to 1 in 10 million, but everybody is happy with 1 in 500, the same as an M9 hitting Japan. Canada loves its cartels and monopolies. In fact, the government once openly formed the Uranium Cartel, until that was perceived as bad political optics. After that, they went underground. The driver is nationalism, and in Quebec it is micro-nationalism. We have a sparse and spread population, so if we want national champions to keep out the grubby outsiders, we form cartels. The system works through alcoholic connections at the Empire Club and big parties. The main job of the big bosses is to keep the system going. They devote nearly 100% of their time looking up, and barely control the companies, since the margins are so high and nobody can botch that up. By charging us poor people twice the going rate for everything, they can keep out the foreign invaders but there is trouble in paradise. Modern technology has not been kind to these organizations. They are used to deploying armies to swat a fly, and have set up rigid hierarchies to achieve this, all following orders from the top. As goes the whole organization, so goes the internal structures (self-similarity, fractal law). All full of wannabee alkies, and preeners. But the invention of internal email and, horrors, the internet has disrupted control. The end result is that they can't do anything involving modern technology, since all of that relies on open communication. The classic case is Blackberry, who achieved monopoly, and joined the Empire Club. For now the banks can rely on their old mainframes, but 400,000 escapee Canadians in the San Franscisco Bay area are plotting their destruction. My son is starting to zoom with his start-up. It will mean the destruction of the big bank cartel. Uber was the most obvious shot to the taxi monopoly, and Toronto was quick to defend the poor slobs. Will Canada have to protect the banks? I can see the laws being written, even now. Canada will become worse than France, protecting every old industry from the past 200 years. Meanwhile, more and more bright Canadians will escape stultification. Most likely. I must be getting old adding qualifications. I usually call it 'absolute' if it's over 80% correct, and I believe in this. Earthquake season has started with the arrival of gas frack waste to OK. If you do a discrete element analysis you will find that disturbance extends several diameters from the main source. New Madrid is definitely within this zone. But NM is totally dead for another big one. It is now living in a 1000 year stress shadow. However, small quakes act as the best strain gauge. So, the hypothesis is that OK will continue with about 3 3's a day and New Madrid will be above the off-season rate. Friday had 6 3's, and Sat, Sun had 1 each (so far). We should have a 4 once a week, a 5 every couple of months, and a 6 by the end of the season. I love being wrong with a hypothesis, since they are always grounded in good physics, but the uncertainties are huge (both ways).